Ever wondered how many eyes a mosquito might have? Do they have two eyes like us humans, or several hundred little eyes? I’ve set out to find all the answers for you, and more. Because as it turns out people have a lot of very interesting questions about mosquito biology. So sit down class, because today’s lesson is all about every little interesting fact you ever wanted to know about a mosquito’s eyes. When I first started to research the topic of mosquito eyes, I encountered a lot of strange questions people asked. Since I’m usually all about how to get rid of mosquitoes, I thought it might be interesting to learn about my worst enemy for just one day. So that’s what we are doing today: Exploring the wonders of the mosquitoes and their amazing vision. Because one thing is for sure: Their eyes are one of the more interesting parts about these little insects. Mosquitoes have two eyes, but their eyes are compounded into hundreds of little eye lenses. This makes a mosquito vision highly fragmented and less focused, yet mosquitoes do have the ability to detect motion very effectively this way. Their compound eyes also have a slightly weaker texture defining capabilities. Some of the lenses also have adopted specific roles: Some have evolved into what are known as ocelli, which are simple photosensitive eyes located on the top of their heads. These are unique lenses can detect some basic changes in light, helping to differentiate between objects and locations. The image below shows the many different compounded lenses perfectly, all sorted and shaped like a honeycomb. 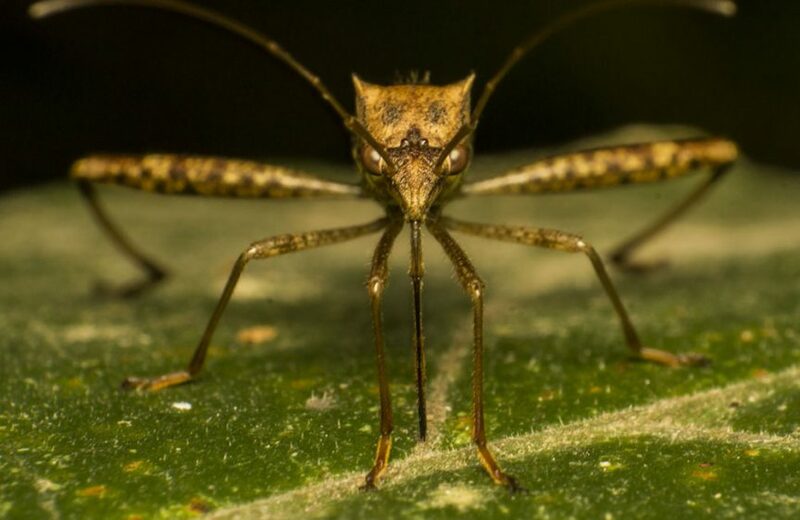 A large part of the face of mosquitoes will be covered in them, making it very easy to find animals or people to bite for their blood. As you might know, the main goal for a mosquito is allowing the female to produce and lay her eggs, for which she would need blood from another species. Detecting the ‘prey’ with vision is very essential in this regard. Millions of years of evolution have shaped the mosquito lenses like they are today. Despite the fact that mosquitoes officially only have dual eyesight, the lenses they have developed over time will all function as individual eyes. They are located on the side of the mosquito head, allowing them to ‘see’ in many different directions at the same time. The scientific name for these honeycomb-like lenses are ommatidia. A single lens is called an ommatidium. 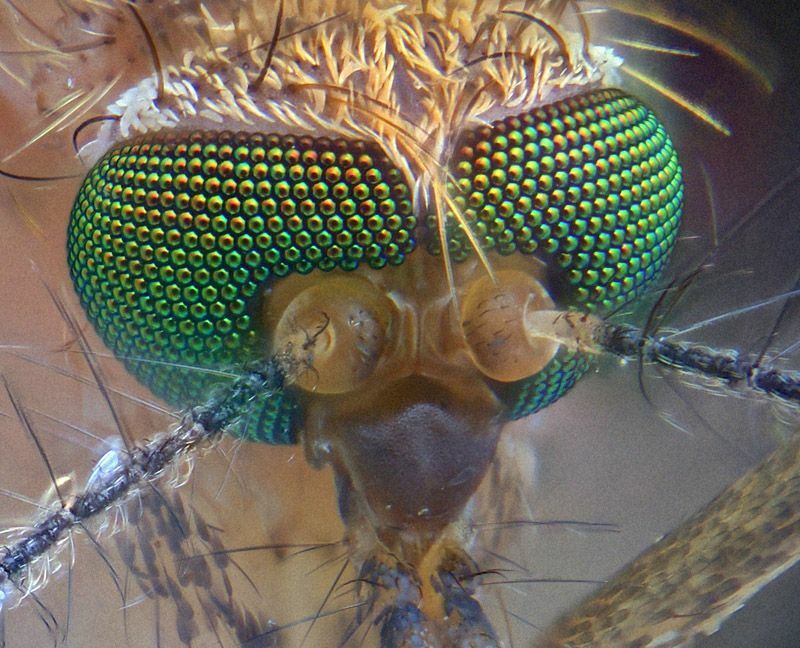 Mosquitoes are capable of creating an image with the many lenses in their eyes. A mosquito will use its vision in order to detect you, however, it is only one of many senses used to find a suitable subject for biting. They can also ‘see you’ through thermal sensory vision, odor, or exhaling carbon dioxide (CO2). Mosquito larvae haven’t yet developed the unique compound eyes, but only possess a pit-eye ocellus. In the early growth stages, this will cause the individual lenses to be square-shaped, while in later stages of the mosquito life cycle they will become hexagonal (like a honeycomb pattern, see the image above to see the finalized shape). So asking if a mosquito can see you would actually be a much broader question. It’s more about being good at detecting you, which is something that’s obviously not only done with the eyes. The sight is only a small fragment within the (rather impressive) sensory arsenal of the mosquito, making it a very successful and stealthy biter overall. Can Mosquitoes See In The Dark? All mosquito species are skilled navigators in the dark. The senses of a mosquito allow it to ‘see’ during nighttime just as well as during the day. Mosquitoes eyes are much more sensitive to light than our own eyes, but mosquitoes can also rely on their other senses to make sure they see where they go in the dark. Please be aware of the fact that ‘seeing’ as a term should be taken lightly in this answer. It’s more ‘sensing’, because they can detect thermal differences. This will help them spot warmer locations even during nighttime, making our bodies the prime location to land on. Together with the irresistible CO2 that is excreted every time we breathe out, the mosquito will find you in a heartbeat, especially indoors. So you better make sure to be prepared, as most of those blood-sucking pests will not hesitate to get a delicious nighttime snack. As little vampires, they will attack you at every opportunity they can get. That’s why it’s all the more important to get yourself some indoor protection. One of the best solutions I found to sleep safely without that annoying buzz near my ear, is to install this Katchy anti-mosquito device. But there’s plenty of other solutions as well. Do Mosquitoes Have Good Eyesight? Mosquitoes can detect a target in a range of about 16-32 feet (5-10 meters), as the researchers at the California Insititute of Technology described in one of their mosquito studies. However, this range is not only determined based on good eyesight, but also on the keen sense of smell that mosquitoes have. A mosquito will not use its eyesight in the same way a human would, since their eyesight is very targeted towards their prey, but not so much on interacting with the world around them. It is therefore not really fair to compare them to ourselves, since we use sight for a wide range of other purposes. A mosquito would only need a limited set of uses, and their eyes have evolved to fulfill those tasks perfectly. Color-detection is not present in mosquitoes, but they can, for instance, differentiate between dark and light-colored clothing. Mosquitoes will see dark objects more easily than light-colored objects, since dark objects generally absorb heat easier. A mosquito has photosensitive receptors at the top of their heads. One study by entomologists at the University of Florida, found that mosquito color attraction is mainly focused on dark-colored clothing, such as black, navy, blue or red. These colors will especially attract a mosquito when they see movement at the same time. As explained before, the eyes of a mosquito are specialized in detecting movement. But apart from light or dark tints, can actual colors be distinguished by mosquitoes? Absolutely not, since this light-dark distinction has everything to do with temperature. Darker clothes absorb and hold heat more easily than lighter tinted clothes, making them more easily visible for the thermal senses of the mosquito. The cause is the color, but mosquitoes are not able to actually see the colors themselves. The color attraction is not present in the eyes (apart from the movement and light differences), but will be detected by the thermal and chemical-sensory organs in other locations of the head of this insect. The difference is that body heat changes are detectable through vision, while different tints of colors will look the same. In that sense, you could say that these so-called skeeters are indeed color blind completely. Now that you know all there is to know about mosquito eyes (or at least, the most interesting aspects of it), what can we do with this information? Obviously, we can use it as a weapon against them and stop those little bloodsuckers from stealing our blood! It’s certainly worth it to look into some options around misleading mosquito senses. This will help in order to get them to behave differently around humans. For example, I’m a huge proponent of using a mosquito magnet such as this one. One of these devices will harness the knowledge in this article and get the insects to do something else entirely. That is, getting stuck in a death trap. It’s a sneaky way to get rid of a lot of mosquitoes in the yard, which will also reduce the odds of finding some indoors. I’ve always loved using my FlowTron machine to get rid of the bulk of those flying monsters, giving me the opportunity to comfortably live out my summer evenings outdoors. But there are certainly a lot of other options to stop mosquitoes as well. I’ve tested and reviews a lot of them over time. The overview page for some of the most popular anti-mosquito solutions is found here. That’s where you can easily navigate around for an anti-insect product that will suit your needs. Even when you’ve already been bitten or aren’t feeling like buying expensive gear, there’s a solution there for you. Anyway, I really hope this article has helped you out and has learned you something. And as always, happy hunting!